There's so much to see in Rome that I don't think an entire week here is adequate unless you race through all the main tourist attraction sites. It doesn't matter where you go, there are massive queues. The queue for the Sistine Chapel snaked all around the Vatican walls. Ditto for the Colosseum. I was an idiot for forgetting to book our tickets online. Speaking of the Colosseum, I was excited to see Laura Bennett, a finalist on Project Runway Season 3 hurrying down the Fast Lane (she was smart enough to procure her tickets beforehand) with 3 of her 6 children in tow. She looked impeccable in her trademark black outfit, perfectly coiffed hair and kitten heels while the rest of us were in jeans, sneakers and a camera hanging over our neck. 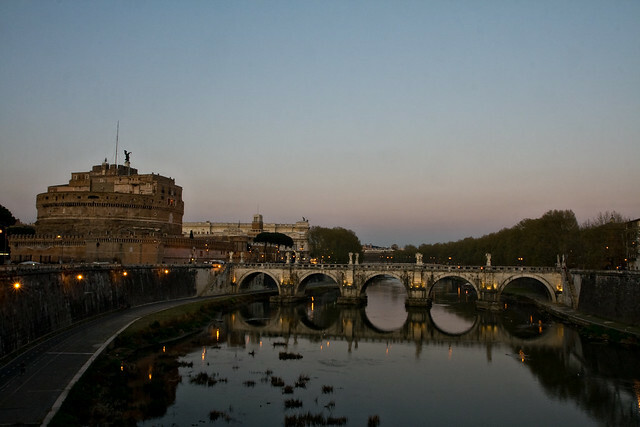 My favorite walk would have to be the bridge overlooking Castel Sant'Angelo aka Mausoleum of Haadrian at dusk. Emperor Haadrian's ashes were placed here in 138 AD before being scattered by the Visigoth looters in 410 AD when they sacked the city. It was converted into a castle in the 14th century. Legend has it that the Archangel Michael appeared on the rooftop sheathing his sword thus signalling the end of the plague of 590. Hence the statue of its namesake on top of the mausoleum. I remember Laura - too cool that you ran into her! :) And these photos are breathtaking! Absolutely stunning! You have a great eye! Rome, glorious Rome! It sounds like you're having a brilliant time--so enjoy, enjoy, enjoy. Your post was so funny the other day about bringing little ones. I went to Rome for two weeks a few years back around this time of the year. The parks were glorious. I hope you've had plenty of time to take in the grounds of many parks and palazzos. Nothing is like a Roman garden. What gorgeous pictures! I've been to Rome once but didn't have enough to time to visit everywhere I would have liked. Jealous!! Hey M! Sorry I haven't visited in forever, been under the weather. Rome has superb architecture and history. I would love to visit it someday. These pics are gorgeous. Thanks for sharing and hope all is well. there's something with rome that you can't find with other city and this is the reason why i have to go back to rome and visit again, even just for a short visit.. though maybe just with hubby i don't know how i can handle with baby!!! 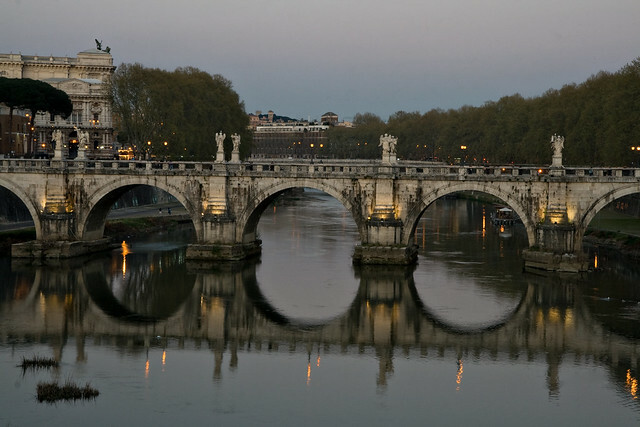 Gorgeous shots, they make me want want to go back to Rome pronto! It's such an amazing place and I love seeing it through your eyes!